Frank emailed me the other day, which was so perfect because I had just been talking with my Lopatka cousin, Debbie Dworski, about him and the work Frank and I had been doing. It has been over six months since we have talked, which I feel terrible about. Sometimes genealogy work ebbs and flows. I don’t like this length of time having gone by, so I am going to work harder to make sure this doesn’t happen again. Plus I miss talking with Frank. Frank old website is down. which is okay because i grabbed the contents. it means i need to transfer everything onto his new website. yikes. here is the text from Frank’s translation of the Golub-Dobryzn pages in the Ringelblum archives. links are not functional — just wanted text here for safekeeping. It’s my opinion only, that all this that I document and write about now, will become believable when I get the documents that I have collected with great difficulty in Poland into some sort of routine. But by the time I do that I may not be about any longer. I must make it clear that this in not an aspiration that I have. I also know that the inevitable will happen so it is my goal now to record and get all the documents into order. I only try here to write down events that took place during the war. I am not sure whether my life, and part of my failures, anxieties, and successes is of any interest to anyone except my own family. In all the short testimonies that I’ve written, I was the victim or the witness to so many sufferings. Many other testimonies have been recorded. Many more books and stories were written. I was 13 years of age when the war broke out, and there will not be many more survivors left after me that would have lived through it that would remember much about it. As I get older I have reached an age now that I feel that I have a duty and an obligation to record the brutality that I’ve lived through. Some and only some of the experiences from Dobrzyn can be substantiated by documents. The days of celebrations for me have long past so I rush to put down in the computer the memories and the life experiences that I’ve been through and remember. I am also sure that there is a spark of eternity in every human being. The building of a home, the planting of a shrub, a child, the drying of a tear will leave a mark on time. As our forefathers said every river flows to the sea. I start this data base document, with my own birth certificate. Putting the few documents that I’ve been able to recover in Poland in order, will show how big our tragedy was. What has happened is incomprehensible. Whilst our roots in Dobrzyn go back for many many generations, the part that I am recording in this Dobrzyn hyperlink section is only the brief period from the outbreak of war 1 September 1939 until the 11 November 1939 when the remainder of the Jewish population was forcefully expelled from there. In those 10 weeks of the beginning of the war, the killings, the gruesome and brutal atrocities that took place, the cruelty that the Germans were capable of inflicting, in such a short period of time, is probably unbelievable for people that have not been through it. I lived there until the 11th of November 1939 when the last remnants of Jews from Golub and Dobrzyn were forcefully evacuated. The 6 million figure, a figure of men, women and children that have perished in the Holocaust is beyond understanding. But when one sees it in the few documents that I have about our little town Dobrzyn and Golub, that figure of 6 million becomes much much larger. The documents that I have only just recently recovered, have stirred up something in me and urged me on to record my experiences. I must be the only survivor from Dobrzyn that was there during the terrible 10 weeks. There is a lot more that I must write. Amongst the documents, I have 2 copies of letters of testimony and 2 lists of victims from Dobrzyn that were given to the Ringelblum archives in theWarsaw Ghetto in May 1941 by 2 witnesses. I have translated them from Yiddish into English for the St Kilda Hebrew Congregation on the occasion when I donated a rescued from after the Holocaust, a Torah mantle, Finials, Breastplate, Crown and pointer. All of the Torah dress and ornaments was from some place in Poland and was being hawked around in various flea market’s by Polish Judaica peddlars. I bought it and brought it with me home and Erev Yom-Kippur 1998 I presented it all to our shule ” The St. Kilda Hebrew Congregation” where it belongs. Copies of the documents will remain in the sanctum of the Ark, whilst the “Keilim” ( the Torah dress and ornaments) will be used for the service whenever Yizkor is recited, to the memory of the victims of the Holocaust..
2 copies of letters recorded by the Ringelblum Archives in Warsaw Poland by 2 eye witnesses from Dobrzyn and Golub now called Golub-Dobrzyn. The second letter was signed of ” to be continued” and was never finished. I don’t delude myself and I am sure that the writers of the 2 letters did not survive to finish their story. On the 6th September 1939 our town was occupied and straight away robberies of grocery and drapery stores began. 2 days after the occupation all businesses and houses without difference, were compulsorily requisitioned. On Rosh-Hashana an order was issued that all men from 15 to 60 years of age to report to the market square. The order came with a threat that any man not reporting to the market square would be shot. Separately the Germans went from house to house dragging the men out from the Synagogue and prayer houses in their prayer shawls and in their yom-tov dress. They were loaded on to lorries and transported to Bydgoszcz (Bromberg), together about 230 men, among them some sick, paralysed and some suffering from tuberculosis. They were forced into horse stables and kept on the stable manure, maltreated, beaten and taken afterwards in an unknown direction. (K.L. Jasniec direction?) From that time on, no trace at all was ever found of them. In Dobrzyn searches were carried out and the best of what appealed to the Germans was taken away. People were taken into custody and monies extracted for their release. During the searches young girls between 18 and 20 years of age were forced to undress completely and forcing all present to leave the home. Whoever refused the order was terribly beaten. The Jewish Council was ordered to bring every day 50 young people for heavy work on the bridge and to cart away all the requisitioned Jewish goods from the stores. This work was undertaken by the local V.D. (Volksdeutsche). The 25th October the most honoured citizen of our town, the chemist Riesenfeld was arrested by the Gestapo as the leader of the Polish Jewry and all trace of him has disappeared. The 8th of November 1939, 35 of the wealthiest families received an order to report to the market square with 35 kilogram of luggage per person. The luggage was taken away on a truck and the families were separated. The children were taken away, leaving some of the parents behind. The children were taken in an unknown direction and until today their tracks are lost. 3 days before this all Golub Jews were arrested. On the 9th of November 1939 at 8 am in the morning about 1500 Germans, some in civilian clothes, ordered that all Jews must leave their homes within 10 minutes and report to the market square. Having all of the population in the market, the “Landrat” Germans ordered that a contribution of 50,000 Zloty’s must be paid. Holding 4 Jews responsible, and promising that after the contribution was settled, everyone will be free to leave wherever they wish to go. The poor town collected 23,000 Zloty’s and 2 baskets of silver candlesticks, gold wedding rings, and various other stuff. After photographing the loot the order was given that the Jews must leave the town immediately and all the old and sick were forced out of town, forbidding even the farmers to use their carts for travel. The howling and cries on the road are impossible to describe. People left everything behind that they carried with them not having the strength to carry it further. The town had 600 families, altogether 3000 people, and all of them were forced out of the town, being beaten with whips in the process. About 2 days before Rosh-Hashana our town was occupied. When it was earlier overrun nobody was affected in town. The biggest part of the population ran away to the neighbouring towns and villages so that there was only a small Jewish population left. But most of them returned to their homes by erev Rosh-Hashana. The first day of Rosh –Hashana all the prayer houses were surrounded. All private homes were searched, and all men from 14 years up to 65 years of age that were in town were taken away. 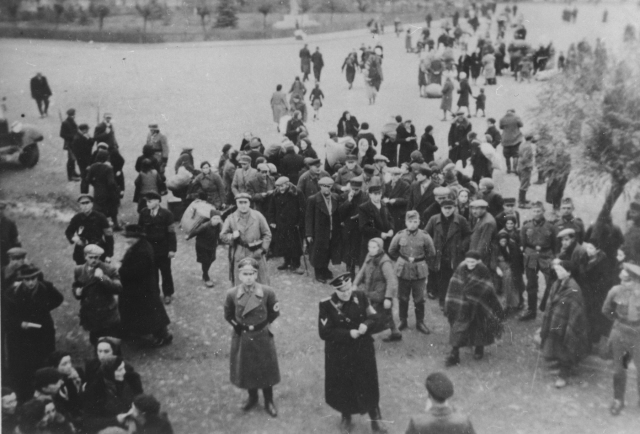 Approximately 270 men in all were taken, loaded on trucks, and taken to Bydgoszcz (Bromberg). They were kept in stables under the worst conditions for 2 weeks. From there they were sent away again to somewhere unknown and the unfortunate families until today don’t know what has happened to them, in spite of great efforts that were made to find out about their whereabouts. All efforts to find traces of them, or any sign of life, were without success. Shortly after this episode an 18 year old young man was shot in the street while returning from the baker with a loaf of bread. The reason for the shooting is unknown. After that many searches took place and various materials and goods from stores were requisitioned and taken away. The shops had to close. Searches for money then started and women in particular were treated in a very dirty way. Forced labour was introduced for the young people which had to be regulated by the Jewish Elders. People were being arrested in town. Among them was the local chemist, a communal Zionist Public figure who took part in every Zionist Congress and was in our town among others one of the most outstanding citizens. He was held in the highest regard and looked up to by all philanthropic institutions to which he was always the biggest contributor. Unfortunately, until this day no trace has been found of his whereabouts or of what ever happened to him. On the 8th of November 1939, 35 families consisting of 107 people received a written order to report with their families on the 9th of November 1939 with luggage of no more then 150 kilograms per family, for the purpose of being evacuated to an unknown destination. All property mobile or immobile had to be written down and recorded of what is left behind, and a copy had to be lodged with the Mayor of the town. All the families duly reported on time before the City Hall, altogether 107 persons (amongst them women, small children, and the old and sick). For whatever reason only 70 persons were sent away and 37 people were left behind. Where the 70 persons and their luggage were taken to is unknown until today. Great and various efforts were made to find out where they were taken to. No sign was ever received from them. On the 10th of November the whole Jewish community was called before the City Hall and was told that in a few hours the remainder of the community must leave the town and can move only in the direction of Warsaw. The community was forced to pay a contribution like gold and silver and most of the people were kept in place and not allowed to return home again. Everybody, including the wealthiest people in our town left their homes with a small hand carried parcel. Being forcefully expelled all of them left on foot. On the way out, there were several deaths. Some very sick people were left behind in town. What has happened to them is unknown. But what we heard was nothing good. group of the above mentioned 400 people and where they have disappeared to. The last name Riesenfeld was not amongst this group. He was taken away a few days before and executed somewhere in the area. How soon the 2 lists of victims were written I am not sure. 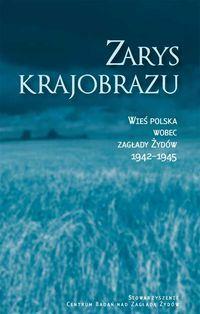 The first list is of all male victims (not complete) dated the 14/9/Wrzesnia (September) 1939. The second list is dated the 9th of November 1939 and is of 35 families, men, women and children. The original 2 lists of the victims are in the Ringelblum archives in Warsaw. The 2 original letters from the 2 unknown witnesses which I translated from Yiddish into English are also in the Ringelblum archives. The first letter is dated the second of May 1941, the second letter is dated the 11th May 1941. Not all the victims of the 2 groups are mentioned. It seems to me that the lists were done by memory only and some of the victims names were unknown to the writer or could not be remembered by him. At the bottom of the page of the last victim Riesenfeld no.188 is a handwritten footnote that says: that altogether were 260 persons. It was on the first day of Rosh-Hashana 1939, on the 8th day after the Germans occupied our town that this slaughter took place. I am the only survivor that was in town at the time when this happened. All of the victims in this group were male. video for frank to watch. Abstract: The Joint Distribution Committee rehabilitates Holocaust survivors in Europe. תקציר: ארגון הג’וינט עוסק בשיקומם של ניצולי שואה באירופה. couldn’t sleep so called frank and had a nice chat. finally scanned frank’s documents this morning. will try viewmate. found this photo on the USHMM’s website. never saw it before. very chilling. probably some of Frank’s family is here. I met my friend Debbie DWORSKI at my first JewishGen conference in Salt Lake City (the 27th IAJGS International Conference on Jewish Genealogy in 2007). Before the conference we had emailed a little bit back and forth as we shared a common surname (LOPTAKA) that seemed unusual. It sort of seemed like I was stalking poor Debbie — I remember that I was so excited to finally track her down at one of the presentations I think she was a little freaked out at my enthusiasm to meet her. To me she seemed like instant mishpucha. Plus if you have been to these conferences, sometimes there aren’t that many people our age or younger — or at least it seemed like it back then. At the Salt Lake conference, I think Debbie showed me documents relating to our common ancestor (Ester Sura LOPATKA). But the conference is crazy and although we kept in touch and saw each other at conferences, talked on the phone, corresponded via email, for some reason we never really focused on these documents. Fast forward 4-5 years, during which time Frank and I have been working on trying to get his information organized. Over this time, despite my side-trip to graduate school which delayed / pushed the momentum down to zero, Frank consistently showed that he has this amazing ability to read and understand the nuances of Polish documents of Jewish relations. See, Frank is special. He is one of the few people from our region who is able to understand the Polish, read the Hebrew, realize the nuances of our shared region, and get the underlying gist of the documents — especially the birth, marriage, and death vital records. Plus as a Holocaust survivor from a town not far from where my family came from, Frank was there. He knows the region better than most, and he knows the Jewish Poland of that region because he has had a passion for learning more about this region during all of these years after the war. Frank is a pathway to the past. He is a teacher. He explains the inherent anti-semitism that may underpin the documents — as the documents were required by Polish law, but were not typically of concern to Jews, so details maybe were a bit slippery / imprecise. In addition to a possibly unfriendly town clark, there were often significant language barriers, cultural barriers, etc. There could be a delay of years in reporting births, marriages, deaths. A regional rabbi may have not come to the local village recently, so the records may not have been made on the date they were recorded — probably they were often not. I am taking the time to ruminate on all of this because Debbie asked me to see if Frank might be able to take a look at some of her LOPTAKA records because some of the town names seemed odd to her. Now I guard Frank as a resource very carefully because I don’t want to overburden him. Plus I want to make sure he is focusing on his document translations, not on mine or anyone elses. So I hesitantly asked Frank to take a look at the documents for Debbie. I was curious to see what Frank might find. It turns out that Debbie is a LOPATA, not a LOPATKA. From what Frank told me on prior occasions when we were going over documents with the LOPATA surname, these are two separate names, with different meanings in Polish. Not the same family. I am going to get Frank’s clarification on this, but long story short, Debbie and I may or may not be mishpucha. It sort of doesn’t matter at this point — she feels like extended family and we have a lot in common beyond the genealogy and similar coloring. But it will be interesting to see what this treasure trove of Frank’s translations brings. A small thing maybe for him, but for us, it is huge. I am grateful, stunned, amazed at his gift and generosity. Keren will be sending photos. yay!! !